Hertz Cyber Supersale - Deal or Dud? Thanksgiving marks the busiest shopping weekend of the year. The day after Thanksgiving has gained notoriety for outrageously good deals, especially for the door-busters. Luckily, those of us who don't want to trample others or be trampled have the option of scoring similar deals from the comfort of our home or office on Cyber Monday, the Monday following the Thanksgiving weekend. While most retailers and businesses go bonkers during this time of the year, rental car companies play business as usual. This is probably because Thanksgiving is also one of the busiest travel time of the year and a great time to charge top dollars for rental cars. The only exception this year is Hertz, which is currently offering a Cyber SuperSale with a discount of 25% on rentals booked now through Cyber Monday (Dec 2, 2013) using promotion code (PC) 194832. This offer is valid on vehicles picked up by Feb 14, 2014, but the reservations needs to be done in the next 6 days, now through Cyber Monday (Dec 2, 2013). In order to qualify for the discount, your rentals must be 3 days or longer (upto 14 days). The deal is valid on rentals in the U.S., Canada, and Puerto Rico, but excludes locations in Arizona, New York, New Jersey and Florida. It's pretty common to see good deals blocked out for rentals in the New York area, but it seems Hertz is now starting to restrict such deals in other locations too. Another Hertz deal from a few weeks back also excluded rentals in Florida and Phoenix (AZ). For a weekly rental at Denver International Airport (DEN) from Dec 11 - Dec 18, the standard rate for the cheapest vehicle was $399. Using the Hertz Cyber Supersale coupon, the total dropped to $316, a saving of 20%. Not bad at all. For a weekend rental at Seattle Tacoma Airport (SEA) from Jan 10 - Jan 13, the standard rate for the cheapest vehicle was $343. Using the Hertz Cyber Supersale coupon, the total dropped to $273, a saving of 20%. The savings are in line with what we saw for the weekly rental in Denver. While saving 20% on your rental car may sound compelling, it's not out of the ordinary. There are dozens of Hertz coupons available at any time, some of which can be stacked together for a double discount. So, how does this deal compare with other available deals? Using currently available Hertz deals, we quickly found an Economy car for $205 for the weekly rental in Denver. This is a huge saving compared to the standard rate of $399 and the Hertz Cyber Sale rate of $316. For the weekend rental in Seattle, we found a Compact car for $105 using this deal, which is way cheaper compared to the standard rate of $343 and the Hertz Supersale rate of $273. 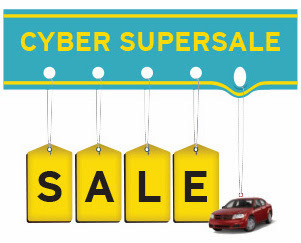 Based on our limited testing, the Hertz Cyber Supersale appears to be a DUD! Please note that most of us have different car rental requirements - location, date, time, vehicle, etc. As a result, we see different standard and discounted rates. Just because a promotion works well (or doesn't) for one person doesn't necessarily imply the same result for everyone else. The only way to find the best deal for your unique requirements is to try em' out for yourself.